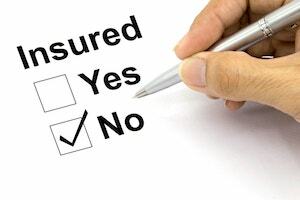 Driving Without Valid Insurance | Chicago Driving Without Valid Insurance Lawyer The Davis Law Group, P.C. Contact Cook County, Illinois Uninsured Driver Lawyer The Davis Law Group, P.C. Under Illinois law, driving without valid insurance is charged under 625 ILCS 5/3-707 (operation of uninsured motor vehicle). Every driver on the road must have the minimum vehicle liability insurance coverage required. All drivers should carry their current insurance card in their vehicle at all times. Illinois law does also allow a driver to use their smart phone or tablet to show proof of auto insurance. A charge of driving without valid insurance will typically require an in-person court appearance. The attorneys at The Davis Law Group, P.C. have represented hundreds of clients charged with operating an uninsured motor vehicle. Driving without insurance is charged as a petty offense under most scenarios, but carries with it serious consequences. A first conviction of this offense will subject the driver to a three-month driver’s license suspension by the Illinois Secretary of State with a minimum mandatory $500 fine (maximum $1,000) plus court costs, and a $100 reinstatement fee. An additional six-month license suspension will be imposed for any person convicted for driving without insurance while currently suspended for driving without insurance. A third or subsequent conviction will subject the driver to minimum mandatory fines of $1,000 plus court costs. In addition, a $100 reinstatement fee must be paid to the Secretary of State in order to terminate a mandatory insurance suspension. Operation of a motor vehicle without insurance, which results in bodily harm to another person is charged as a Class A misdemeanor. Acquiring insurance after receiving a ticket for driving without valid insurance is not a defense. However, showing proof of insurance on the vehicle as of your court date may allow you to obtain court supervision and avoid a license suspension as long as you have not previously received court supervision or a conviction for driving without insurance. Under these circumstances, a $100 fine plus court costs will be assessed. Lastly, a driver that receives court supervision or a third or subsequent conviction for driving without valid insurance will be required to obtain SR-22 insurance from their insurance company for a three-year period. SR-22 insurance is a special type of insurance that is reported to the Secretary of State on a monthly basis. As a result, failure to maintain the SR-22 insurance for the required period of time imposed by the Secretary of State will result in a suspended license. The traffic attorneys at The Davis Law Group, P.C. represent clients in traffic-related matters throughout Illinois including Cook, Lake and DuPage Counties. Our attorneys offer phone consultations on a wide variety of traffic tickets. Contact us today to discuss your case.